There is definitely something about Friday nights and gaming that seems inseparable. To me there was nothing like being a kid and coming home from that last long day of school for the week, with its spelling tests, math tests and other Friday quizzes, and than melting my brain on some video games. Of course the experience was even better when you could share it with friends, or just with a nice plate of delivery pizza. As adults we no longer have to endure tests and quizzes every Friday, but none the less Friday’s still encapsulate a final measure of stress and closure after a week of work and home stress. My current definition of a good Friday night is coming home, having a nice dinner, a little something to drink, and ending with a relaxing evening of TV and/or Music, till I can barely keep my eyes open. Well, to be more accurate this has been my definition of a good Friday night since I moved last June. Before then I use to do something I personally called “8-bit Fridays”. In my previous house once my gameroom was established and my old NES had a proper and permanent home to be accessed and played. At that time I decided it was time to start picking up a lot of those games I missed out on as a kid. So as a treat to myself for a long week of work, and coincidentally also being my paydays, I decided to buy one of these NES classics every Friday. I achieved this by either stopping by a local retro video game store near my place of work during my lunch breaks, or by hitting eBay on Friday nights usually just before bed. The only problem with this plan was that, being a retro game collector these NES titles and games of other systems, eventually began to stack up in piles of the unplayed. Of course being employed full-time and having kids it’s easy to prioritize video game playtime right out of the picture, since time for gameplay is non-existent, something I’m sure many of you relate to. In time though I discovered that if I wanted time to get through my pile of games, I would have to find myself playing games into the wee small hours of the morning on Friday and/or Saturday nights (pardon me I mean early Saturday and/or Sunday mornings). As inconvenient and as annoying as something like that sounds, I eventually got use to, and even looked forward to these nights. I could buy a game I wanted, and also spend some uninterrupted time playing a few of the titles I had in my unplayed pile, it was a semi-perfect scenario. 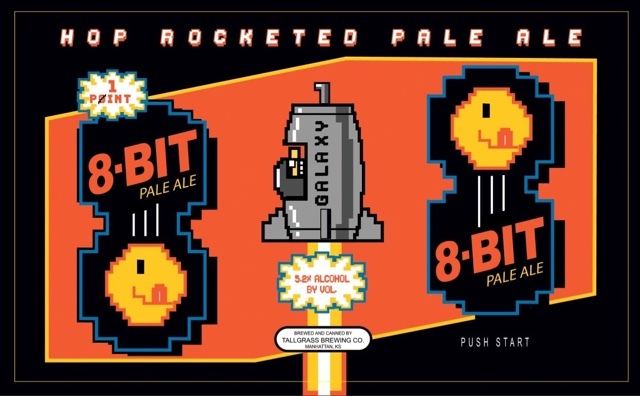 Then one night I came across a beer at a local liquor store (Binny’s for you Chicago folk) called somewhat coincidentally 8-bit Ale. So as I sat there late one Friday night drinking a can of 8-bit Ale, and playing Pro-Wrestling on the NES I came up with a little something I liked to call “8-bit Friday’s”. Essentially, “8-bit Fridays” celebrated adding to my NES collection, as well as just enjoying the time I had to play these games and relax at the end of a long week. Of course “8-bit Fridays” was a bit of a misnomer due to the fact that my pile of unplayed games has hosted everything from the 16-bit era to those of the modern era like the Wii U and XBox One. Also, as previously indicated these celebrations of gameplay weren’t always on Friday’s. None the less though I like the name so it’s going to stick for now. Since I moved in June, 8-bit Friday’s haven’t been as easy to celebrate especially with my old game room now a memory. My NES, SNES, SMS, PS3, WiiU, and Xbox One do have a place in my current living room for now, but the relaxing environment leads me to lose myself in TV, and forget gaming all to often. So as 2015 drew to a close I decided the return of 8-bit Fridays needed to be a 2016 resolution. So as I write this article on Friday January 15th, 2016 and also my first payday of the year I have decided there is no better evening than this one for 8-bit Fridays return. At Half Price Books I picked up Karate Kid, and Lee Travinos: Fighting Golf both for the NES, and in good shape, plus the price was right. 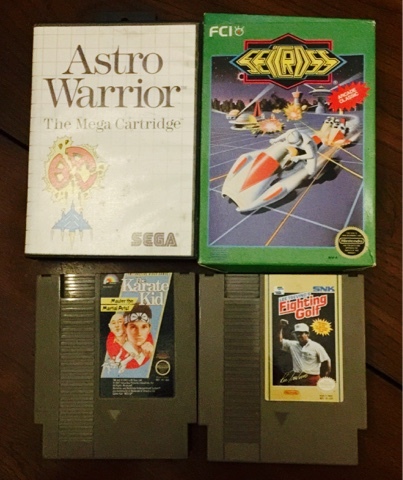 Later that evening from eBay I picked up Seicross boxed for the NES, Spiritual Warfare for the NES, and Astro Warrior for the SMS. 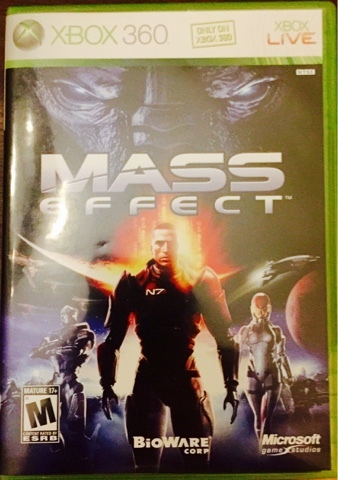 I decided to try and play Mass Effect (1), which yes I know isn’t an 8-bit game. This is actually for the XBox 360, and was one of the first 100 games made backward compatible for the XBox One, which is what I was playing it on. Do you have a game night or game day? If so feel free to respond back and let me know.